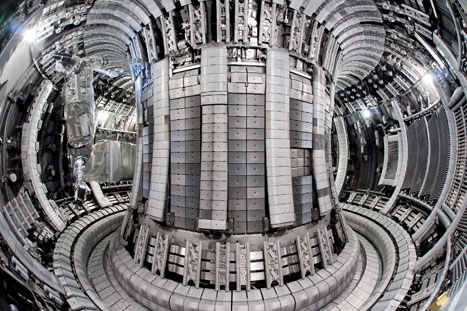 Work at the UK’s JET project could help bring commercial nuclear fusion a step closer. The world’s largest nuclear-fusion experiment has a new lease of life. Joint European Torus (JET), at the Culham Science Centre near Oxford, has restarted after an 18-month shutdown to replace the entire reactor lining and is now collecting data that will be vital to the construction and operation of its successor, ITER, currently being built in southern France. ITER – the name is not an abbreviation, but is Latin for ’next’ – is intended to be the first fusion reactor to achieve self-sustaining operation and to generate net energy; that is, more energy than it takes to operate it. Like JET, it will be a tokamak: a toroidal (doughnut-shaped) vessel that constrains a plasma made from hydrogen atoms using powerful magnetic fields, while heating it by pumping in microwaves, pushing an electric current around the ring and injecting fast streams of more hydrogen atoms. Eventually, the magnetic pressure and the heat overcome the tendency of the hydrogen nuclei in the plasma – which have the same electric charge – to repel each other and they are forced together to form helium nuclei, releasing a burst of energy and a high-energy neutron. Known as magnetic confinement, this is one of two forms of fusion currently being attempted around the world as part of the effort to determine whether fusion can ever be a practical way of generating electricity. JET is the only tokamak in the world capable of handling tritium, the radioactive form of hydrogen with two neutrons in its nucleus, which is essential to fusion, as it joins with the single-neutron-form deuterium to form a helium nucleus. It has achieved this target several times, but there are still several technical stumbling blocks between JET and ITER. One of these, until recently, was the reactor lining. Like most of the world’s tokamaks, JET was lined with tiles of carbon-fibre composite. However, this lining would have been useless – in fact, catastrophic – for ITER. Carbon was a good choice because of its low atomic number – it has six electrons – and the resilience of graphite to high temperatures. But when tritium is involved, problems start because of the complex chemistry of carbon. The carbon atoms released into the plasma react with hydrogen to form hydrocarbons, which build up in deposits on the reactor wall. When the form of hydrogen available includes tritium, these hydrocarbons are radioactive. ’You build up a tritium inventory, trapping it in the wall of the machine, and it becomes a radiological issue, a safety issue and an economic issue; tritium supply is limited. And you’d have to develop a method of removing it from the walls,’ Matthews said. This wasn’t a problem in JET, because of its relatively small size (about 2m across) and the short duration of its plasma pulses (generally a few tens of seconds), so hydrocarbon build-up was small. But ITER and successive generation-scale tokamaks will be 10 times the size and operate for much longer, with a typical ITER pulse lasting for about 15 minutes. With JET’s status as the only practical test bed for ITER technology, it fell to the team there to develop and test a new plasma-facing wall. Beryllium is probably the lightest engineering material. Melting at 1,300°C, it is lighter than aluminium and stiffer than steel, and is already used in highly specialised engineering applications, mainly in space and defence; for example, the primary mirrors for the James Webb Space Telescope are made of beryllium. ’There’s a specialist beryllium engineering industry; it’s not big but it’s there,’ Matthews said. ’There are a handful of companies in Europe and a few in the US, mainly dealing with alloys such as beryllium-copper, but also using the pure metal. As it happens, JET has experience in using beryllium. The first director of the facility, Paul-Henri Rebut, commissioned some beryllium plasma-facing components in its early days and Culham had a stockpile of about four tonnes of pure metal. This, Matthews said, was just enough for the new lining. The only part of the reactor not lined with beryllium is a trench around the base of the torus known as the diverter, where the particles in the plasma interact directly with the wall and lose their energy. This region is lined with tungsten tiles, as the higher atomic weight of the metal prevents atoms from being dislodged when light helium nuclei collide with them. The replacement of the lining had to be carried out all in one go, because any carbon present inside the reactor would quickly coat the surface and render the beryllium useless, Matthews explained. The process took 18 months and was mostly carried out using remote-handling equipment, because neutron bombardment had rendered the outer shell of the reactor radioactive. ’It’s certainly the largest remote-handling job that’s ever been done in fusion,’ he added. 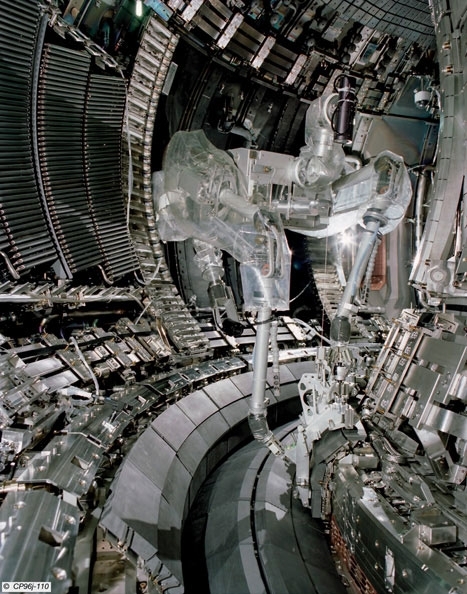 While the other form of fusion under study, laser-fired or inertial-confinement fusion, doesn’t require the management of a plasma, the beryllium wall of JET will still provide valuable insights, Guy Matthews said. Laser-fired fusion works by forcing a tiny capsule containing deuterium and tritium to implode by hitting it with lasers from all sides, within a vacuum vessel. The pressure wave crushes the fuel and leads to fusion. The most advanced experiment, at the National Ignition Facility in California, is scheduled to attain net energy from fusion within 18 months. But, according to Matthews, the technique still needs plasma-facing components.